The Senate’s Better Care Reconciliation Act (BCRA) significantly cuts Medicaid, the program that insured 39% of US children in 2015 and 50% or more in New Mexico, West Virginia, and Mississippi. The Congressional Budget Office estimates that the BCRA will increase the number of uninsured Americans by 22 million, among them many of those currently covered by Medicaid. However, many supporters of these bills argue either that Medicaid delivers no health benefits to the insured or actually harms them. If this is what they believe, then surely reducing Medicaid enrollment is a virtue of the BCRA, not a flaw. Whether Medicaid is harmful has been debated for years. In this post, I call your attention to emerging evidence that Medicaid benefits children. Liberals have trouble understanding how Medicaid could be harmful. It’s true that some doctors are less likely to accept a Medicaid patient than a privately insured one. However, a doctor who turns down a Medicaid patient would be even less likely to care for an uninsured one. So how could the well-being of someone on Medicaid be improved if they became uninsured? These liberals have missed the point of the conservative argument. That view, best articulated by Charles Murray, is that the social safety net harms you by exposing you to incentives that keep you dependent. In a welfare-dependent family, it’s harder for a child to develop into an independent, functional adult. Getting social assistance, therefore, traps you and your family in poverty. The strong prediction by conservatives is that poor kids who grow up as dependents of the welfare state will be less healthy and less functional than other kids. Arguments that Medicaid is ineffective usually cite the Oregon Health Insurance Experiment (OHIE). This randomized experiment found that getting Medicaid coverage did not improve several important physiological measures of health. Benjamin Sommers, Atul Gawande, and Katherine Baicker (who was the Principal Investigator of the OHIE) rebut this argument in the NEJM. Likewise, Aaron and Austin argue in The New York Times that Medicaid critics have misinterpreted the research. According to these analysts, the OHIE had little chance to find substantial physiological benefits because it studied a small group of people for a relatively brief period of time. Other studies involving large populations and designs that allow causal inferences have shown that getting Medicaid saves lives. It follows that the ideal study of Medicaid would look at large populations of people over long periods of time with a design that was a randomized experiment or approximated one. It turns out that this is to some degree possible if you look at the child and adult health outcomes of kids who grew up in states where poor families had varying degrees of access to Medicaid. Congress created Medicaid in 1965, but because it is administered and paid for by both states and the federal government, states started their programs at different times and varied in who they covered. 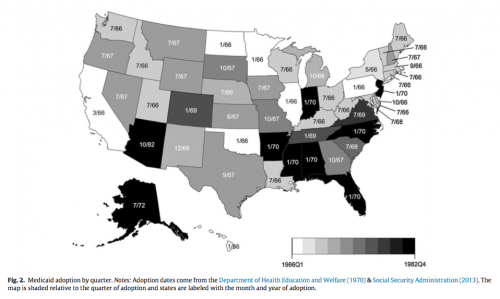 This map from the Social Security Administration shows the year and quarter when states began Medicaid. The month/year in which states adopted Medicaid. From Boudreaux et al. This means that poor kids born in 1966 in Oklahoma, which started Medicaid in that year, were likely to have had much more cumulative insurance coverage by the time they reached adulthood than kids born in 1966 in Arizona, which started Medicaid in 1982. So if Medicaid is bad for you, then everything else being equal the states that had larger proportions of kids covered for longer periods of time should have populations of adults that look worse, on average, than other states. Boudreaux, Golberstein, and McAlpine analyzed data from the Panel Study of Income Dynamics. They found that Medicaid coverage in early childhood (age 0–5) was associated with statistically significant and meaningful improvements in adult health (age 25–54). Interestingly, they found that Medicaid was associated with lower blood pressure and a lower overall chronic disease score, which contrasts with the lack of physiological effects in the OHIE. Boudreaux and his colleagues found these benefits only among the low-income people most likely to have been covered by Medicaid. how a rapid expansion of prenatal and child health insurance through the Medicaid program affected adult outcomes of individuals born between 1979 and 1993 who gained access to coverage in utero and as children… We find that cohorts whose mothers gained eligibility for prenatal coverage under Medicaid have lower rates of obesity as adults and fewer hospitalizations related to endocrine, nutritional and metabolic diseases, and immunity disorders as adults. We also find that the prenatal expansions increased high school graduation rates among affected cohorts. a policy discontinuity [in] several early Medicaid expansions that extended eligibility only to children born after September 30, 1983… We find a substantial effect of public eligibility during childhood on the later life mortality of black children at ages 15-18. The estimates indicate a 13-20 percent decrease in the internal mortality rate of black teens born after September 30, 1983. Before Medicaid, higher- and lower-eligibility states had similar infant and child mortality trends. After Medicaid, public insurance utilization increased and mortality fell more rapidly among children and infants in high-Medicaid-eligibility states. Mortality among nonwhite children on Medicaid fell by 20 percent, leading to a reduction in aggregate nonwhite child mortality rates of 11 percent. In another analysis, Goodman-Bason looked at the effect of Medicaid coverage when you are 0 to 10 years old on adult mortality rates, whether the children found employment when they became adults, and what they received in transfer payments. about 345,000 lives were saved between 1980 and 1999—54,000 among whites and 291,000 among nonwhites. each full year of early-life cumulative [Medicaid] eligibility reduces white ambulatory difficulty rates by 3.8 percentage points (s.e. = 1.2) and nonwhite rates by 2.9 percentage points (s.e. -1.8). The government earns a discounted annual return of between 2 and 7 percent on the original cost of childhood coverage for these cohorts, most of which comes from lower cash transfer payments. Are these findings credible? These are complicated analyses with many moving parts. A lot hangs on the idea that you can make an “everything else being equal” comparison between states based on how they administered Medicaid. Looking at the map above, there are regional correlations in when states started Medicaid, and there are likely correlations with state poverty and other factors. Yet even within regions, there is variation in when Medicaid started and how it was run. The papers I’ve summarized look for this kind of variation in Medicaid coverage policies between comparable states. This variation allows them to infer that Medicaid coverage during early childhood caused these better child and adult outcomes. It’s a large claim and it’s certain to be disputed. But if you accept this analytical strategy, what do these findings show? First, the prediction that Medicaid harms children is flat wrong. There’s no evidence that Medicaid kids are worse off. To the contrary, on several important outcomes kids were better off if they grew up in states that started Medicaid coverage earlier and covered more kids. Second, it appears that the most important times for coverage are when you are in-utero, an infant, or a young child. This reinforces James Heckman’s argument that early childhood is a critical period where we get the highest return for investments in improving the social determinants of health and human development. Third, the effects of early exposure to Medicaid are found not just in health, but also in educational attainment, employment, and reduced welfare dependency. In other words, Medicaid works on precisely the issues that conservatives care the most about. Provision of Medicaid to families with poor children appears to give those kids a better chance of growing up to be high functioning adults. As such, it promotes fair equality of opportunity. Conversely, these findings count against predictions that Medicaid traps children in lives of poverty. What the findings do not show is that Medicaid, or public health insurance of any kind, is the optimal way to invest in families or child development. It would help if we knew how Medicaid benefits children. Is it increased access to health care, is it because health insurance reduces the out-of-pocket costs to families, or is it because having health insurance reduces the psychological stress of being a family? These studies don’t tell us. So it’s possible that some other policy would help kids more. For example, we don’t know whether paying for a poor family’s Medicaid is more cost-effective than giving that family the actuarially-equivalent cash. This and similar proposals deserve serious consideration. But it is critical to note that the comparison between providing Medicaid and giving cash is irrelevant to the debate about the BCRA and the House of Representatives’ American Health Care Act of 2017. Instead of taking resources from Medicaid to fund cash transfers to the poor, these bills take cash out of Medicaid to fund tax cuts for the wealthy. state may, if its citizens choose, serve as a laboratory; and try novel social and economic experiments without risk to the rest of the country. Many argue, following Brandeis, that federalism is a way to learn what works in social policy. To learn about policy, however, we have to ask how can we actually get reliable information from the laboratories of the states. One answer is that we do it through differences-in-differences analyses of variation in the implementation of state programs, such as those that we have reviewed above. If you believe that the independence of states gives us a laboratory for democracy, you should take seriously the results on Medicaid that have come back from the lab.